Th e delightful cottage garden at May Gibbs’ Nutcote features both native and exotic trees and shrubs with many annuals and perennials. The site is long and narrow with the house straddling its width. The Gardens are divided into sections by a trellis and the house. A major feature is the original brick path from the street, edged by flowerbeds. On the waterfront side of the house, there is a breathtaking view of Sydney Harbour from a paved terrace. Pocket rock-gardens designed by May line the terrace and are filled with colourful annuals. Steps lead down the rock-face to the waterfront lawn and various native trees. At Nutcote, May Gibbs and her husband created an English style garden with roses, annuals, shrubs, hedges, lawns and a few fruit trees. 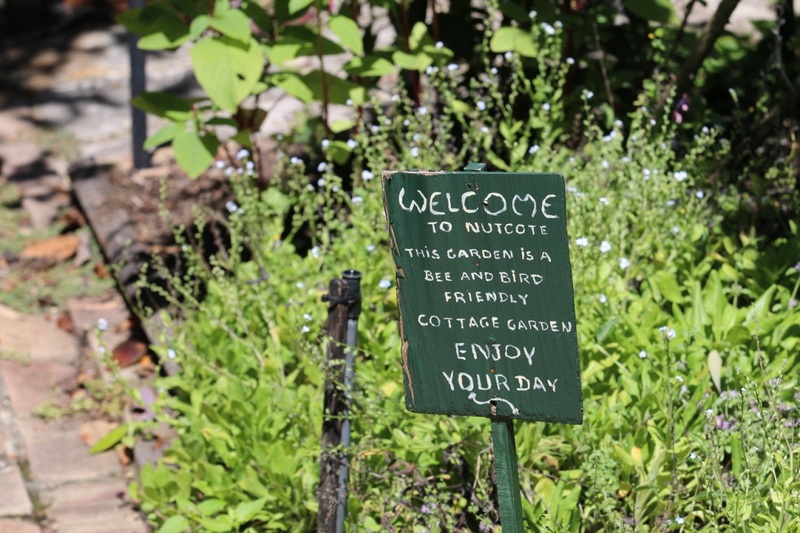 While North Sydney Council undertakes basic maintenance of lawns and hedges, the present garden is largely maintained by Nutcote’s Gardens volunteers, broadly in accordance with May’s original plantings. Only two of the original roses (Dorothy Perkins and Lady Hillingdon) survive today, but many plants listed in various diaries and letters have been reinstated. Some hydrangeas also survived. May and her husband did not plant native plants – it was not the fashion in those days – but retained the native trees on site when building the house. May preferred to study native flora in the bush on campin g trips. 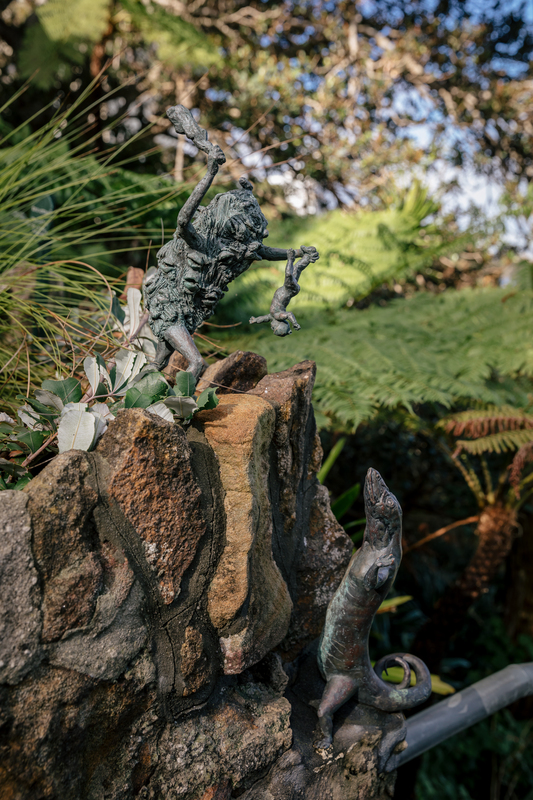 The current plantings are largely in accordance with the landscape scheme prepared by Fiona Robbe of Knox and Tanner Landscape Architects in 1992, which was based on historical research and site inspection. All vegetation not of May Gibbs’ tenure was removed in the 1990s. As mentioned above, modifications to this scheme have been initiated by the Gardens volunteers at May Gibbs’ Nutcote, based partly on their experience of which plantings are viable in the Gardens. Under the guidance of horticulturist Helen Wood, volunteers undertook significant work from 1992-2000 including the reintroduction of May’s hedges and the trellis and arbours over the path. Curators and volunteers at May Gibbs’ Nutcote have also discovered many references relating to the Gardens in May’s work which were able to be used to personalise the Gardens. 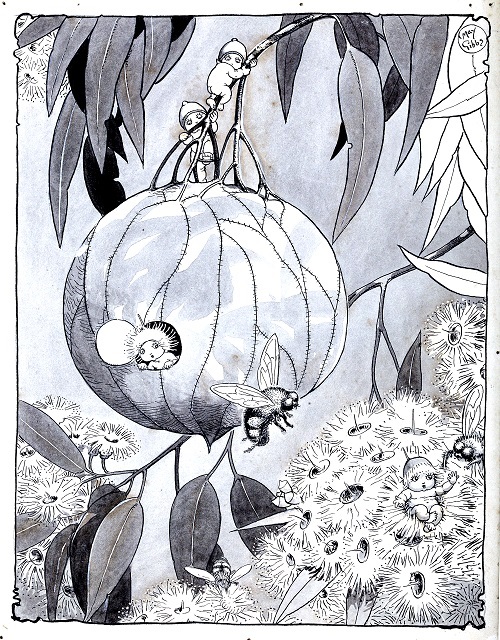 For example, an illustration from Mr & Mrs Bear & Friendsshows the lemon tree outside May’s bedroom window, which can also be seen on the film which is shown to visitors. Mr Bear sits under the lemon tree and represents May’s husband, who wrote in a letter that it was his favourite spot. Likewise the caterpillar hedge is based on a comic strip. The importance of the Gardens to May’s work is indicated in an interview for the National Library in 1968 when she reflected, “ ‘Nutcote’ is a dear little place with a long, long garden. I used to walk around the Gardens, weeding it and loving it, and with a book in my pocket and a pencil and that’s where I got my best ideas, out in the open, gardening.” The Gardens was a constant source of pleasure and inspiration for May Gibbs. She enjoyed working there, taking notes and creating stories. While living at Nutcote, she continued to create the comic strips, Bib and Bub and Tiggy Touchwood, and wrote and illustrated Scotty in Gumnut Land, Mr and Mrs Bear and Friends and her last publication, Prince Dande Lion. 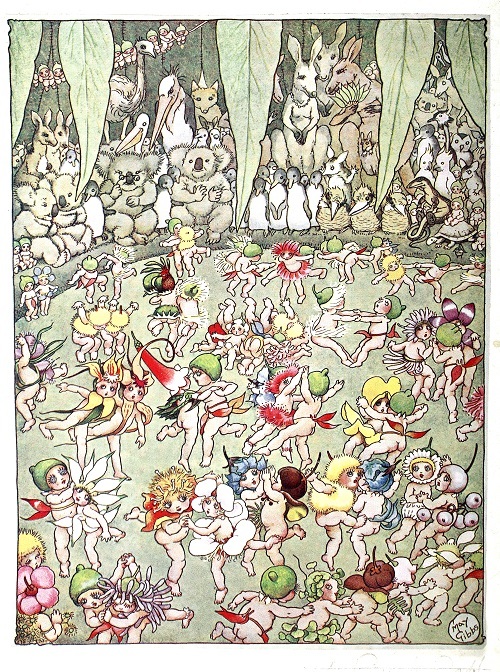 May’s last book Prince Dande Lion (1953) was based on the Nutcote Gardens and May’s knowledge of plants. It was a fantasy with puns on plant names and the names were listed at the back of the book. Volunteer gardeners have been able to use this list as a permanent guide to relevant plants to reintroduce to May Gibbs’ Nutcote. Letters and diaries written by May Gibbs and her husband, who died in 1939, often included references to flowering blooms, the condition of the lawn and new plants. Her husband wrote “Mamie could spend her whole life pottering, fairly strenuously I must say, around her Gardens, varied by a good long camping tour in the country”.